In 1990 Mitsubishi released the GTO. Since the Japanese sports car would be exported to the US, the GTO model designation was not allowed on our shores. GM already had the rights to that for their famed Pontiac GTO. Because of this, the car would be marketed as the Mitsubishi 3000GT in the states. Fortunately, this didn’t stop the car from coming across the pond. The 3000GT was so advanced for its time that we are just seeing some of the advancements it featured in other high performance cars. Pretty much every modern supercar now has active aero features. In the early 90’s the Mitsubishi 3000GT featured both front and rear spoilers that would adjust to speed automatically. That was akin to witchcraft in 1990. Just recently the Porsche 911 GT3 and GT2 started using all-wheel steering. Allowing the rear wheels to assist in steering helps these 911s take corners amazingly fast. The 3000 GT was well ahead of the game and used the rear wheels to turn sharper at speeds above 30 mph. In 1990 the Mitsubishi 3000GT was available with a twin turbocharged V6. The Porsche 911 Turbo wouldn’t start using twin-turbochargers until 1995. Sure Porsche used twin-turbocharging in the 959 in the late 80’s, but not in their non-limited production cars. Mitsubishi certainly was using technology that was cutting edge in a non-supercar at the time. 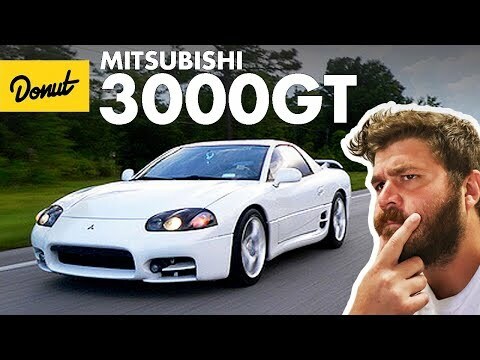 Check out the below videos to learn more about just how advanced the Mitsubishi 3000GT was as well as the quirk. After that, scroll down to the comments and let us know what you think of the 3000GT.